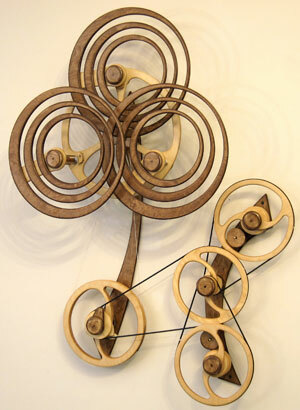 Summer Rain is a breakthrough sculpture for me incorporating motion, sound and a new type of drive mechanism. Three overlapping wheels, composed of nested circle forms create a pattern that suggests ripples in a pond. The motion is accompanied by the very soft, melodic tinkling sound of small wood levers striking different lengths of thin brass rods. The motion and sound makes me think of a gentle summer rain. The mechanism was the most challenging part of this sculpture. My original design proved too inefficient and complicated. I found that I had trouble setting it up and I knew from previous experience if I found setting up one my pieces to be a challenge, others would have nothing but problems with it. I lived with the first version for a number of months trying a number of little fixes. Nothing worked so I put it aside for several months but kept thinking about it. I finally hit on a simple solution that actually used fewer parts, was more reliable and ran longer. Sometimes it pays to stop playing and just think about things although usually I'd rather just play! • "Your new sculpture is Magnificent! Love your work! I first came a crossed your work wile visiting a little shop in New York a few years ago. Since then I've been trying to figure out a way to afford one of your works.